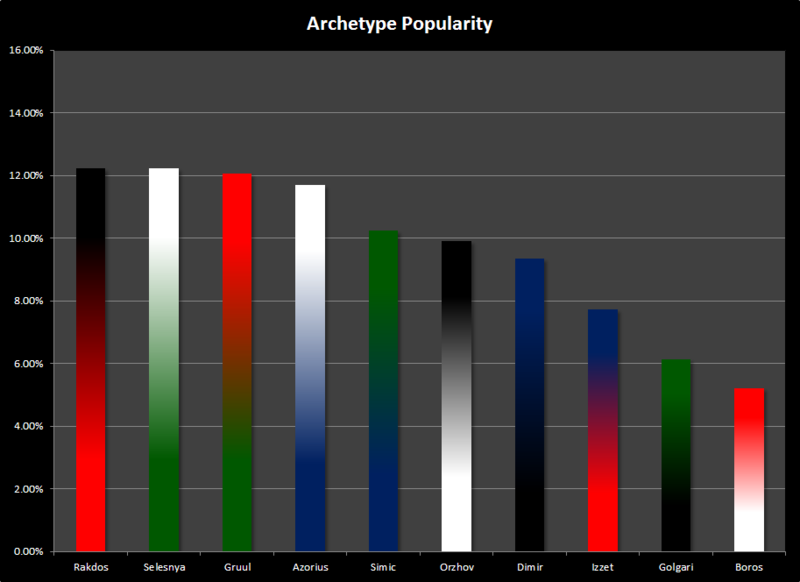 Welcome back to Ars Arcanum, the MTGO stats-based limited column. This is the fastest I’ve turned around to write another Magic article, but I wanted to start talking to people about M14 while the format is still pretty fresh. While I’ve never been one to get very excited about core set limited, I do know that it is an important entry point for a lot of people, especially since it isn’t quite as overwhelming to newer players. If you haven’t drafted very much, then M14 is a much better place to learn than RTR block limited. Since the community cup announcement, I’ve picked up a few new followers and readers, and so I’d like to take just a moment to explain what it is that I do in these articles. The idea is simple; I watch replays of other people’s games on MTGO. I then record certain data points, like the colors being played, or the turn on which the game ends. Once I have a large sample size, I take the data and do some number crunching, and then present it to my readers in ways that I hope will be useful. Finally, I take this data, and I analyze what it tells us about the format, and I try to give readers a better understanding of the architecture of the set that is being drafted. You can check out the Ars Arcanum archive at the bottom of the article and see the analyses that I have done for other draft formats. I should also take a moment to talk about what you should expect to get out of this article. 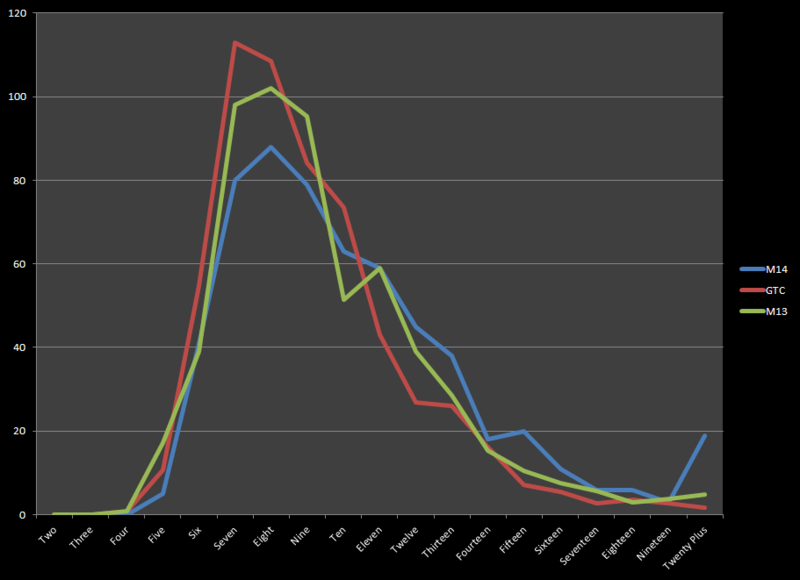 The goal is to take a slice of the format, by sampling events from a given time period, and then analyze what is being done by players in the format. Basically, this is supposed to give you a kind of bird’s eye view of the format. I have a metaphor that I like to use to explain this. If you were a general going into war, you would send scouts to look at the terrain, tell you where the enemy was encamped, and also tell you the most important strategic locations of the area. This information would help you with your strategy as you prepare for battle. However, as soon as your forces start fighting your opponent’s forces, all of that planning becomes much less relevant, because the battlefield is shifting so rapidly. These articles are supposed to give you an idea of which positions are strategically advantageous, but you have to use your own skills to figure out what to do when you get into the actual draft. Sometimes players come to these articles looking for a kind of blueprint about a specific way to draft the format, and that is not what I’m doing at all. It’s just a way to step back and get a bigger picture view of the format. Phew. It’s great to go over this stuff again, and I always get a better idea of what this series is really about when I do a new article, but now, let’s get into the numbers. It’s been a long time since we had a format as slow as M14. 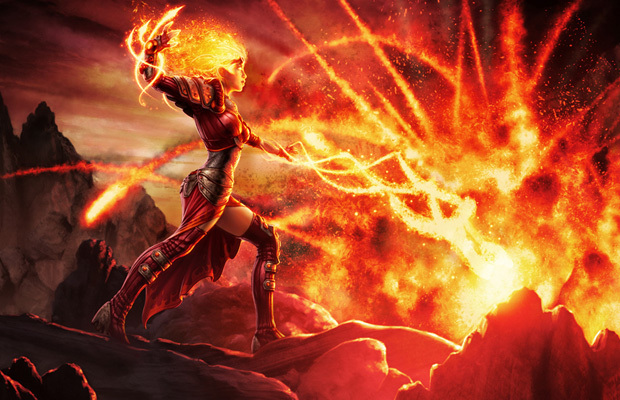 Mostly, we’ve had fairly fast, tempo-based formats for the past three years. Triple Return to Ravnica was a little bit slower than average, and Scars, Scars, Besieged took a fast format and slowed it down significantly, but since ROE, we just haven’t had a format like M14. For the first time in ages, more than half of all games will make it to at least turn ten, which is when we start to expect seeing our seventh land. There are more games that end after turn 10 than end from turns 2 to 8. This is a dramatic shift in speed from the last few sets, as we can see from the charts above. What is it that makes M14 so slow? 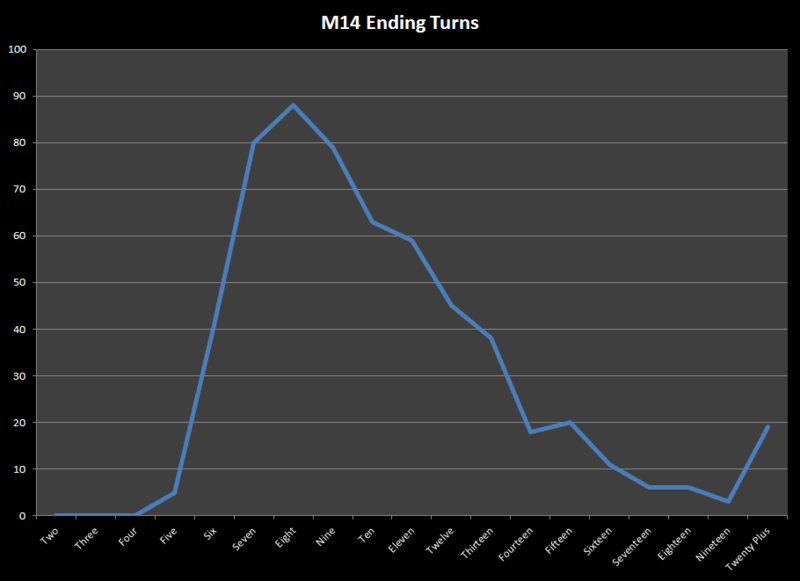 Marshall Sutcliffe, over at Limited Information, put together a pretty good article analyzing the factors that make M14 a slow format. Basically, M14 is made up of a lot of creatures with higher toughness than power, especially at lower converted mana costs. Furthermore, while there is a decent amount of common removal in M14, it isn’t particularly high powered. Pacifism and Claustrophobia would be top tier removal in any draft format, though not as good as something like Doom Blade or Lightning Bolt since they leave the creature on the board, but in M14 they are very much the best of the bunch. For the rest of the set, you have cards that are imprecise, temporary, color intensive, a little expensive, low impact in the late game, or conditional. Keep in mind that I don’t mean that any of this removal is bad, but that it isn’t quite as fast or efficient or flexible or powerful as comparable removal spells from past formats. They are all reasonably high picks, but they all contribute to making the format a little bit slower. In most of the formats we’ve drafted over the past few years, it’s been difficult to reliably cast seven drops. In a format like GTC, cards like Colossal Whale, Devout Invocation, Garruk’s Horde, Howl of the Nightpack, or Primeval Bounty would have been nearly unplayable. But in M14, these cards are legitimate first picks. They allow you to break out of the stalled board states that come up in most M14 games. On the flip side, cheap creatures lose a little bit of their value. A 2/2 for 2 is still very playable, but you shouldn’t be excited to pick up cards like Sentinel Sliver, Corpse Hauler, Regathan Firecat, or even Goblin Shortcutter before the wheel. These cards are fine to fill out your curve, but they will generally be irrelevant in the late game, and you want to prioritize some of the higher impact cards. Another important part of slow formats is that you need to pick things that help you use your mana efficiently in the late game. Expensive cards are usually good for this, but if you only draft those cards, then you will still be in a bad board state if your opponent curves out. In order to combat flooding out in the late game, I’ve been taking mana sinks and card advantage a little higher than I would otherwise. Divination and Opportunity are two cards that will always make my main deck if I’m in blue. Rootwalla is a great example of a mana sink, since the threat of activation usually makes it unblockable in the early game, but in the late game it essentially acts like a Rumbling Baloth. Another card type that this affects is auras. Normally I’m not a big fan of cards like Illusionary Armor, Mark of the Vampire, Lightning Talons, or Trollhide. The potential to run into a two-for-one makes them very risky. However, if you are playing a more aggressive deck in a slow format, you need a way to turn your two and three drops into game breaking threats in the late game. For example, in the UG deck, Predatory Sliver is pretty good because it can come down in the early game and put pressure on your opponent while you play tempo spells like Time Ebb. But when the board inevitably stalls out, the Predatory Sliver will often become irrelevant. But if you drop a Trollhide on it, then it is suddenly a powerful late game threat that will often eat an opposing creature when it attacks. Normally this would be very risky, but it is also important to remember that in a stalled out game, your opponent will typically have already used their removal, and so you can often play these cards into safe situations and open up a closed board. You still don’t want to lean too heavily on auras, but they can be a powerful complement to a creature based strategy in a slow format. Now that we’ve looked at the speed of the format, let’s get into the two color archetypes. The first four decks on our popularity chart are all pretty neck and neck. We have the RB deck, which is usually based around sacrifice mechanics. Act of Treason is an essential part of this deck, since it basically turns into Slave of Bolas (which happened to be one of the best uncommons in Alara Reborn). The WG decks are the kind of decks that start off with an early Serra Angel, Banisher Priest, or Pacifism, alongside a lot of creatures. Sometimes it will also have a lifegain subtheme with Angelic Accord and Voracious Wurm providing reasons for gaining life. The RG deck is pretty simple; it just has a bunch of large green creatures (and Marauding Maulhorn) paired up with burn spells to clear out the board or finish out the game. Both the WG and the RG decks are also often based around slivers as a core mechanic. The WU deck is also pretty self-explanatory; a lot of flyers with some removal spells. After that, we’ve got the UG tempo decks and the WB decks. That color combination is a little bit more complicated; basically, these decks use powerful removal spells, but typically win off of the power of an enchantment subtheme or a lifegain subtheme. The best WB decks tend to use some combination of the two, by using Blightcaster and Auramancer to keep the board clear, while using Angelic Accord to take over the late game. It is worth mentioning how popular the sacrifice, lifegain, and enchantment themes are in this set. In typical sets, lifegain spells, threaten effects, and auras tend to be underpowered, especially relative to their popularity. New players tend to overvalue these effects by a lot; they just love these kind of home run/strike out strategies. 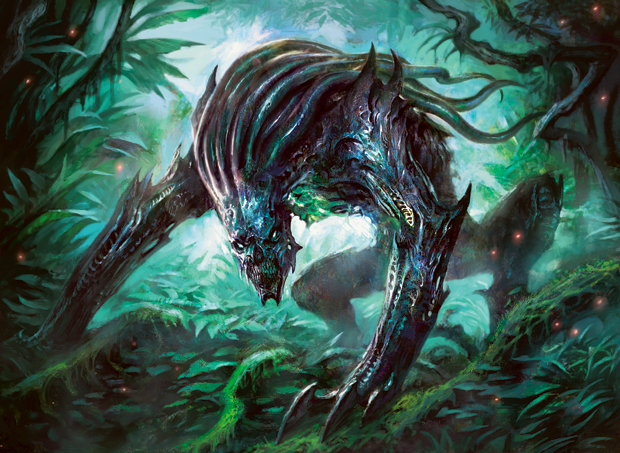 M14 is unique in that it makes these effects into central deck themes, and players have jumped on these decks in huge numbers. A lot of players learn that they aren’t supposed to play those effects, but they still love them, and they’ll look for any reasonable excuse to run the cards. Giving them entire archetypes centered around those effects was sure to be popular. When we add slivers to the mix, it isn’t hard to see why people are drafting certain archetypes so heavily. The chart that I find fascinating is the color chart. Green is the clear leader, with white, blue, and black all being about equal in the middle, and red far in back. Green is obviously very powerful in this set, and it isn’t very hard for players to pick up on the power of 4/4s for 4 mana. Slivers are also an obvious and linear strategy that attracts people to green, so it’s natural to see these kind of numbers. The strange thing is the popularity of white. I keep hearing people talk about how white is the consensus weakest color in the set; it seems that nearly every player I’ve talked to has figured this out. 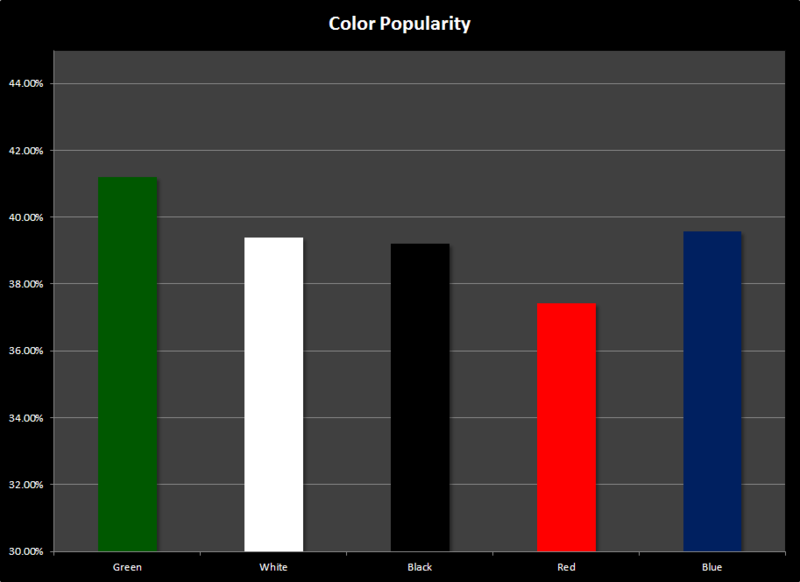 However, White is still tied with blue for being the second most popular color. I think that this is because the lifegain, enchantment, and sliver subthemes are all a part of white. These are the kinds of strategies that people will go out of their way to play, and this makes white a very popular color, even though it has the perception of being bad. 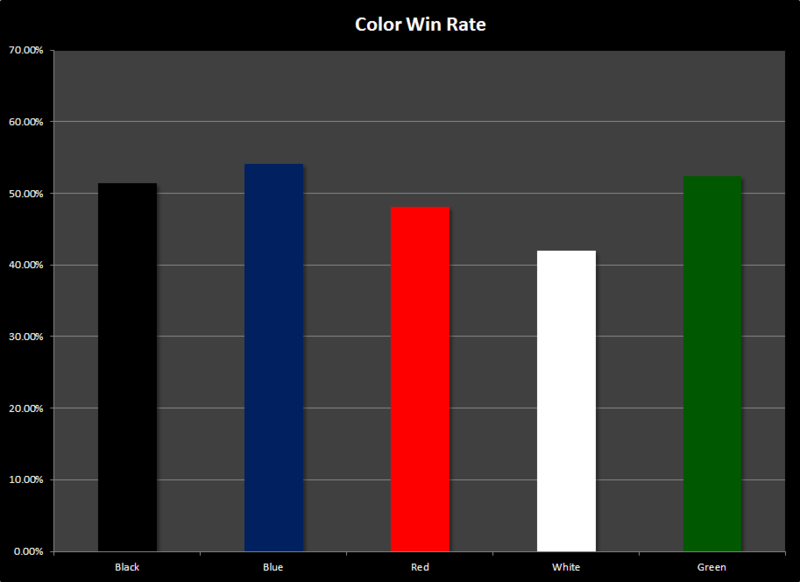 In our next section, we’ll look at the win rates for color combinations and for the colors themselves, and we’ll see whether these opinions are justified. Let those charts sink in for a moment. A year ago, I wrote an article about AVR limited, and the charts for these two formats are eerily similar. Two things should be obvious from this chart. First, UG is awesome. Second, white is terrible. The BG deck is also quite strong, with a 62% win rate, which would be high enough to easily be the best deck in the field in most draft formats. But UG just destroys the rest of the field with a 67% win rate. Most players are saying that blue and green are the strongest colors in the format, which accounts for some amount of the win rate, but these two colors also combine extremely well to fight against a slower metagame. They have a lot of inherently powerful synergy. The only problem with learning this win rate is that it doesn’t tell us what to do when both blue and green are not open, but the answer is pretty clear. You should try to be UG from the outset, with the option of substituting black for either color if they aren’t open. If neither blue or green are open, then you draft a RB sacrifice deck, and you avoid white like the plague. I find it fascinating that UG performs so well, despite the fact that green is far and away the most heavily drafted color, while blue is tied in second place with white. While UG itself doesn’t rank really high in the rating, its two colors are drafted pretty heavily. The reason is that both blue and green are especially deep, especially relative to their set. In the other colors, M14 really does have a lot of chaff, but both blue and green have high picks deep into their respective pools. Blue’s best commons are Claustrophobia, Trained Condor, and Time Ebb, but will also find one of Messenger Drakes, Nephalia Seakites, Divination, Essence Scatter, Disperse, Sensory Deprivation, and Frost Breath in most packs, all of which are completely reasonable cards to play. While green’s best cards aren’t on the same level as Claustrophobia or Pacifism, green does have a very flat power level. Rumbling Baloth, Giant Spider, Rootwalla, Elvish Mystic, Deadly Recluse, and Predatory Sliver are all very high picks, and that only includes the really good cards in green. The next tier includes easy to play cards like Giant Growth, Lay of the Land, Ranger’s Guile, Plummet, Advocate of the Beast, Trollhide, Hunt the Weak, and Sporemound. Even if you are fighting with someone over these colors, you are still going to be easily able to put together enough playables to field a strong deck. 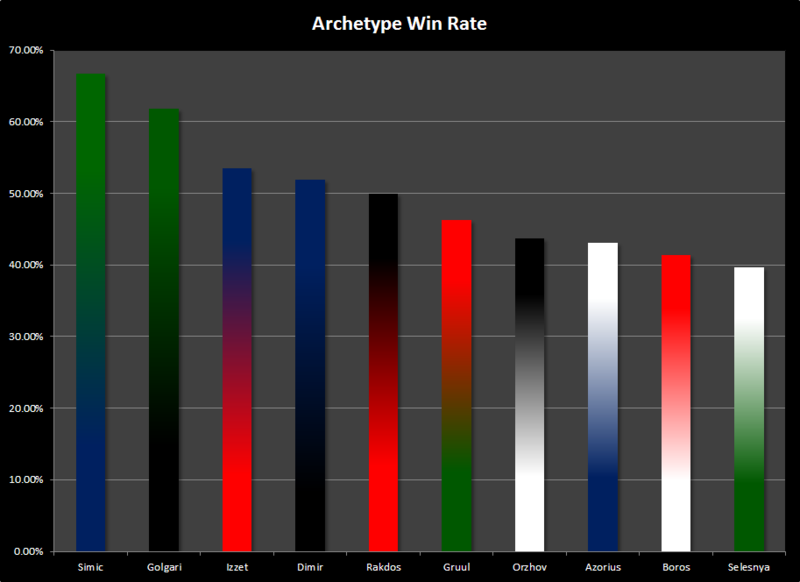 This accounts for a lot of UG’s win rate; even the mediocre UG decks are significantly better than the majority of the field. UG is also built on a lot of strong natural synergies. Trained Condor and Rumbling Baloth is one of the strongest two card combinations in M14. It can often compete with combos like Trading Post and Angelic Accord, or Blood Bairn and Act of Treason. This is because both cards are incredibly powerful on their own, but when they come together, you are hitting your opponent for 6 damage a turn at a very early part of the game. Blue decks are very good at getting evasive creatures to deal damage in a stalled board, but they aren’t very good at gumming up the ground. Green is very good at getting in early damage and then gumming up the ground, but it has a harder time breaking through a stalled board state in the late game. When you combine them, you get a deck that is able to play above the curve creatures early on, take out a significant portion of your opponent’s life total, and then close out the game with flyers. Tempo cards like Time Ebb, Frost Breath, and Disperse are at their best in decks that are able to put a lot of power on the board, and then take advantage of that power by clearing out blockers for a crippling attack. Green is able to field these creatures early on, which allows the tempo spells to do their work. With Divination and Opportunity, these UG decks even make up for their biggest weakness, which is getting out card-advantaged in a long game, but drawing four cards is a great way to turn the tide in the late game. Even cards like Trollhide or Scroll Thief are powerful in UG. Those two cards pair up really well together, but Scroll Thief can also get a boost from Hunt the Weak, while Trollhide is probably at its best on a Trained Condor, Nephalia Seakite, or Messenger Drake. The BG deck benefits from green’s natural depth, but black doesn’t have quite the same characteristic. It also doesn’t have as many of the same natural synergies. However, there are four cards that make BG a particularly potent combination. The first two are Liturgy of Blood and Quag Sickness, for obvious reasons. Green has a lot of natural strength, and a few powerful removal spells goes a long way toward winning the game. The other is Mark of the Vampire; earlier, I mentioned the usefulness of very swingy enchantments in stalled out boards, but BG is the deck that really shows off that power. If you get in one attack with a Rumbling Baloth that is wearing Mark of the Vampire, you’ve gotten all of the value that you need out of the aura. Typically that means that you will force a chump block, or possibly force your opponent to trade two creatures, but you also gain six life. If your opponent draws removal and deals with your Baloth on the next turn, you’re probably still breaking even on card advantage, in addition to the life. And sometimes you produce a threat that your opponent simply cannot beat. The next card that is Wring Flesh, which is probably at its best in BG. You can still use it to take out utility creatures like Academy Raider, but it also does most of the same work of Giant Growth in creature on creature combat. With cards like Rumbling Baloth, your opponents are often going to have to double block in order to take your creature down, and Wring Flesh will usually turn that into a two-for-one. The third deck that I want to discuss is the UB control deck. I mentioned that if you find yourself pushed out of UG, you will want to supplement one of the other colors with black. This is easy for BG; you are making a very similar deck already, and it just means taking black cards to fill the holes, and paying attention to particular little synergies with Mark of the Vampire and Wring Flesh. But UB is a very different beast. This isn’t a tempo oriented deck; it is a full on control deck. In these two colors, there is a lot of removal. Time Ebb, Claustrophobia, Quag Sickness, and Liturgy of Blood all take out opposing creatures without losing card advantage, but even Disperse and Quag Sickness are pretty useful in this deck when you can pair them up with Scroll Thief or Archaeomancer. While Doom Blade, Sengir Vampire, and Air Elemental are all uncommons that you clearly want, another card that excels in the UB deck is Blightcaster. In fact, I think that UB is actually the best Blightcaster deck. You already have Quag Sickness which works with Blightcaster to become a two-for-one, but you also pick up Claustrophobia and Sensory Deprivation. Doom Blade is also at its best in UB, since you can use it to clear the way for Scroll Thief and turn it into a cantrip, or you can get it back with Archaeomancer in order to take over the late game. Mark of the Vampire is also fairly useful in UB, since you can pair it up with an evasive creature to make a must-kill threat. If you put it on a Messenger Drake, you’ll even mitigate any lost card advantage if it dies. I wish that I could go more into the particulars of how to draft the different archetypes in M14, but this article has already gone on long enough. 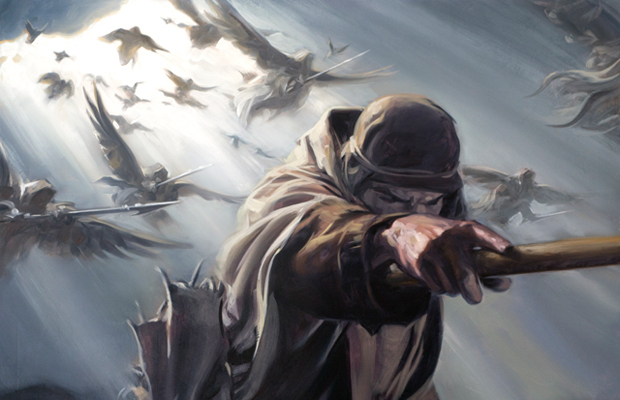 If you feel like you have particular insight into any of the other archetype decks in M14, then please leave a description in the comments below. For example, it is probably worth talking a little bit more in depth about the RB sacrifice deck. As players recognize the power of UG, I would expect players to draft that color combination a little more heavily, which would leave players more room to move into RB, and could move that archetype farther up in win rate. 1. M14 is a slow format. It is slower than the majority of formats that we have drafted over the past year. 2. Seven drops are much more playable than normal, and are a useful way to break open a stalled board in the late game. 3. Powerful auras like Mark of the Vampire or Trollhide are also useful for breaking through a stalled board once each player has used up all of their removal. 4. M14 contains a lot of archetypes that are very popular, but that require you to play cards that aren’t consistently powerful, like lifegain, enchantments, slivers, and sacrifice mechanics. 5. UG is easily the best deck in the format, with BG and UB coming up pretty close behind. 6. At this point, the best strategy is probably to start off trying to draft blue or green, and then substitute black for whichever color ends up missing. 7. Blue and green are both very deep, which means that you can fight over those colors and still end up with a deck that is better than the majority of the field. 8. BG is another powerful deck that can make better use out of Mark of the Vampire and Wring Flesh than other decks. 9. The third best deck is UB control, which uses Scroll Thief and removal to generate card advantage, and then uses Archaeomancer to buy back removal in the late game. 10. UB is also probably the best enchantment deck in the format. I’m going to try to get together another article for the week of the 26th of August, but it’s possible that I’ll be swamped with work since it is the beginning of the school year. If not, I encourage you to check out the MTGO community cup, which will be taking place on August 30th and 31st at PAX Prime. 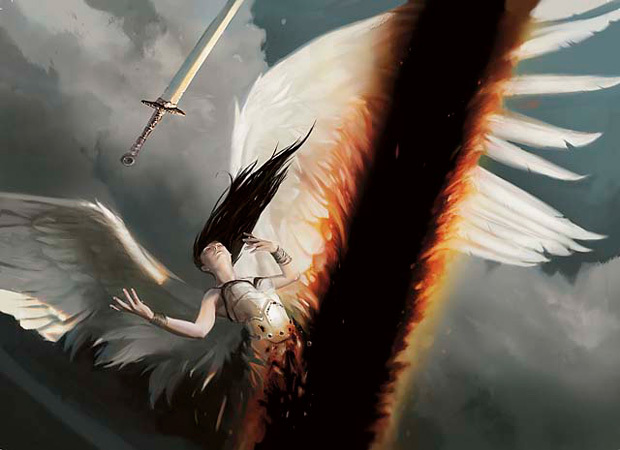 The formats include Modern Masters draft, which always leads to fascinating drafts; Wacky Draft, which means that the players will be forced to draft with certain stipulations such as King of the Fatties which requires you to pick any card with power 4 or greater if able, or Look Sharpe which requires you to draft whichever card has the best dressed creature in the artwork; Cube Draft, which will lead to some awesome and potentially degenerate decks; as well as Ironroot Chef, for which we don’t have all the details, but that I assume will mean having a certain set of cards we must conclude in our constructed decks, followed by a very small time for a deck building window. In any case, it should be a fun event where you can see some of your favorite MTGO personalities squaring off against WotC employees. As always, you can follow me on twitter @oraymw for updates about articles. I’ve also put up a Tumblr account at http://oraymw.tumblr.com/ where I post links to my articles. You can go there and subscribe to the RSS feed, and then you’ll be able to get updates whenever a new article goes live. You can also check out my stream on twitch.tv/oraymw. Finally, I encourage you to check out the podcast that I do with my buddy Zach Orts, which is called All in the Telling. In it, we look at stories from a professional standpoint in order to get a better understanding of why they are important to the human experience. But mostly, we just talk about what makes awesome stories awesome.